Standing in the middle of the darkened Walter Phillip Gallery, waiting for the videos to commence, I wonder how an artist can so seriously set out to do something Canadian artists continually struggle with – drawing upon a perceived aesthetic of a locale to create an artistic experience that articulates the sensation of being in the Canadian Rockies. But the lights begin to come up on the five screens surrounding me and the same two performers make their entrance into the screens, gathering the viewer’s attention from the front of the room towards the back. 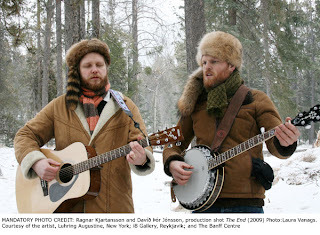 First, at the front, a man walks out to a grand piano in the middle of a frozen snow-covered lake, then on one of the screens to my left, two men in sheepskin coats and coonskin caps come out with two acoustic guitars. On the right, both men stand on a precipice overlooking the Bow River, one holding an electric guitar, while the other smokes a cigarette. On another screen in the back left corner of the room, the two musicians walk out to a drum kit and another guitar, and finally, at the back of the room, the two men enter on screen, seemingly on a mountain trail, one with a banjo, the other with a guitar. They count everyone else off, and begin playing a composition that oscillates between the screens over the next 30 minutes. 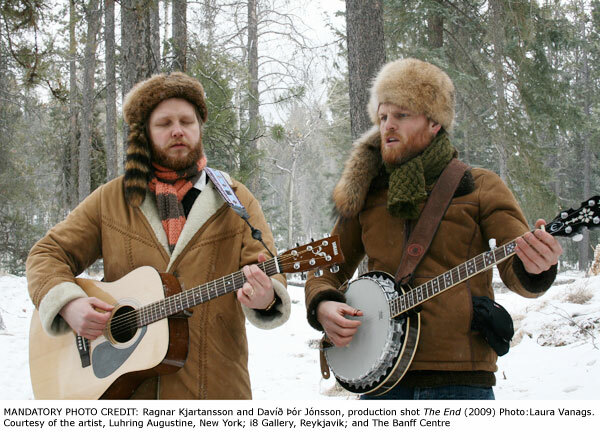 The performers, Kjartansson and his collaborator Davíð Þór Jónsson, perform in each video as the same character, wearing the same outfit in each of the five videos. In classic-fitting jeans and hiking boots, both men sport sheepskin coats of the ‘stalwart peasant’ Canada once tried to lure from western Europe, and coonskin caps – the kind often associated with “The Frontier” but which only exist in mythology (at least in Canada). When they are not playing their instruments, the two men smoke cigarettes and kick the snow, looking more like two men waiting for some divine cue to lead them back into the music rather than collaborators with themselves in 4 other videos. They no longer seem so serious among the trees and the snow --there are hints of the dry Scandinavian sense of humour within their work. While their costume shows a knowledge of the stereotypes of the terrain, it also lampoons it little – it’s difficult to take someone too seriously when they have a raccoon tail brushing their face. The musical composition sounds a lot like a blues band jamming, a sound not associated with the Rocky Mountains or with Canada. Against the sublime scenery, however, with snow falling, the faint crunching of feet in snow and heavy winter breathing into the microphones suddenly seems appropriate to the sad, persistent melody of The End, carried through from beginning to end by the banjo. The pairing of the subdued music with the sublime scenery seems all too fitting for Kjartansson’s goal of making an artwork that captures the complicated feelings evoked by a specific place. I pace around the darkened room, getting closer to some videos, allowing the individual soundtracks to hold me before a performance across the room draws me nearer to it. In the end, I sit in the middle of the floor, turning on occasion to watch the videos behind me. The sound reverberates off the walls, recalling the great landscapes that they play in, hinting at the stories and histories of many people and cultures in the Bow Valley that don’t seem heard but add to the cacophony of the so-called sublime landscape. 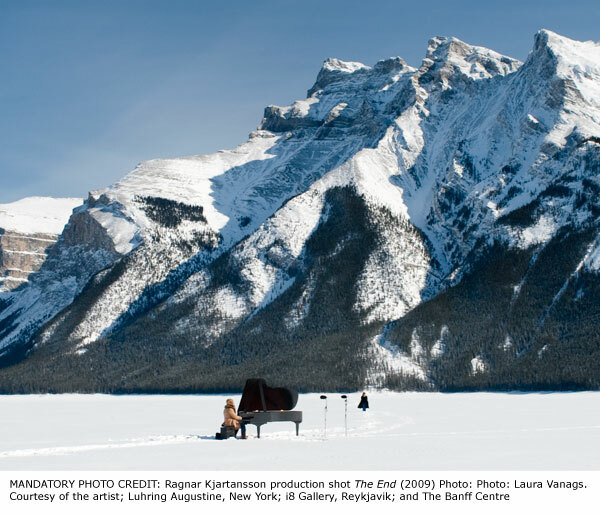 From the perspective of an Albertan who spent a lot of time in her youth in these mountains, Kjartansson tackles something very personal and very subtle which resonates with my own search for identity and an art that articulates those feelings with as much nuance as Kjartansson does. However, The End was shown at the Venice Biennale last year and I can’t help but wonder what kind of a resonance the work had with non-Canadians who knew and didn’t know the terrain Kjartansson was working with. Is this a place of fond memory? Perhaps it is some icy dreamland, or worse, nothing at all. It looks too cold and too pristine to be real. Or does the common search for identity draw in all viewers? At the end of the video, as the music winds down, and it seems that Kjartansson isn’t trying to impose a specific aesthetic on the landscape – it’s impossible to compete with mountains so old, a landscape so vast. Instead, as the screens dim out, one by one, the artist sets off across that frozen lake, --like all our western heroes who are the products of a fantasy of identity. read the Edgy blog and check out the full programming at edgywomen.ca. Please click on the title to read the full review on Canadian Art Online. check out the Edgy programming and read all the edgy blogs at edgywomen.ca. Read the full review on Shotgun-Review.ca by clicking the title. Preview for Jess Dobkin's "Everything I've Got"
When abroad, whether for work or leisure, or often for both, I inevitably drift towards a city's culture, be it the usual museums, cuisine or architectural landmarks. Pretty typical, as one glance over any city's trademark postcard often demonstrates its most unique elements of art and design as one can visually cram into a single image. Finding myself on break in Shanghai, I gladly admit I have been shamelessly riding a culture bender, wandering this magnificent city's endless streets satiating my non-stop curiosities. Standing tall as one of the most spectacular and modern cities at the start of the 21st century, Shanghai has certainly shifted rapidly into one of the world's leading urban centers—a conscious move that has drawn its fair share of praise and criticism for its development and displacement. With close to 20 million people residing in this old port city, its skyline has been infiltrated by an assortment of gorgeous and gaudy steel and glass towers looming over many of its heritage buildings from its British colonial era. Along the most infamous strip of old and new is the Bund, a stretch along the west side of the Huangpu River dominated by old banks now filled with high-end shops and some of the city's most innovative galleries, 18 Gallery and the Shanghai Gallery of Art. Like everything else in Shanghai, art is driven by reputation and market value, which creates an output of mostly object-based works riding market trends. But here on the Bund of all places, contemporary art has flourished as a process-orientated experience dealing directly with the district and the city. Turning its old industrial areas, such as Tianzifang, into a "creative industry park," Shanghai has really succeeded in balancing and capitalizing tourism, functionality and its own history. As a series of average lane factories from the 1930s, Tianzifang is being touted as what New York's Soho used to be for good reason. Spanning a maze-like area of 20 000 square meters filled with galleries, boutiques, studios, restaurants and cafes, the area has become a hugely successful venture attracting artists and designers from all over the world to work and live here. Similarly, in 2002, Shanghai's municipal economic committee officially took over 41 000 square meters of former industrial factories and warehouses along Suzhou Creek and turned it into another creative industry park now internationally known as M 50. While trendy condominiums are currently for sale and entire complexes sat demolished as piles of debris and rubble, there were also rows upon rows of galleries and design studios under repair and overflowing from the old mill factories. Home to spaces such as Island 6, Shanghart and Twocities, the park features more than 130 artists from over 10 Mainland provinces and 16 foreign countries and districts, including the United Kingdom, France, Italy, Swiss, Israel, Norway and Hong Kong. Wandering around the vast network of open air spaces was certainly a very different feeling than one gets from a typical museum or gallery experience, as here, there is an integration between art, the city and its history. Same goes for the art shown. While it's consistent to note that bad art exists everywhere, the strong works to surface were simply phenomenal in their honesty and engagement with the rapid development of the region. 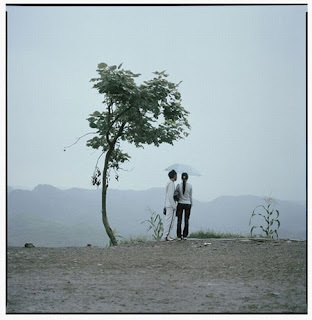 Being far more impressed by the young photographers who range from the fantastical to performance-based, Luo Dan's solo exhibition, The North and The South, at Epsite stood out for me in its limitless sentimental bewilderment. Documenting ordinary moments with a profound clarity, the photographs hold a starkness that do not attempt explanation at the strange and estranging. 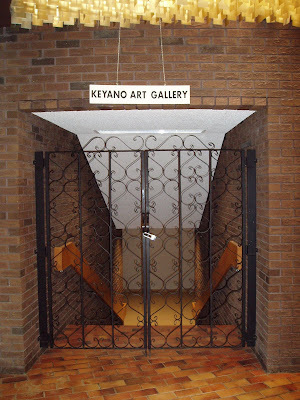 As an artist with a unique voice, his work, along with hundreds of others each year, has been given a venue to communicate its own sense of identity while being able to dialogue with each other as well as an international art audience, all the while proving to be be economically viable and culturally enriching. The first thing I noticed as I arrived in Fort McMurray is just how thick the trees grew together. Nestled within a valley and existing amongst the trees, this is the real Northern Alberta—five hours north of Edmonton, which if you looked on a world map, is already pretty far north and removed. As a quick survey: there are no sidewalks to follow. A series of parking lots with more pick up trucks than I could keep count of connected back onto the highway. Brand names and smells I have only ever associated with Canadian airports lined the town, and small independent businesses and grocers from around the world dotted the rows of strip malls. I would be told it’s beautiful in May, but by mid-summer, the june bugs are large and aggressive. Same goes for the ravens. By my third day, the air quality offset an allergic reaction I never even knew I had, and this is after having lived in the smog of Hong Kong for a number of years. There’s no doubt in my mind that it’s actually the bush out here, and while the aerial viewpoints of the open tar pits and tailing ponds is an image burned in many a mind, being in the actual town of Fort McMurray where people live a day-to-day existence is a far more peculiar situation. If you remember a few years back, Syncrude pulled their funding out of all arts organizations in Alberta with the intention to direct their philanthropy to improve the quality of life for the people (and their employees) in Fort McMurray. Focusing on health and wellness, there are now several new fitness complexes paid for by various oil and gas companies, including one which housed a brand new library, gym and soon-to-be indoor waterpark. As for culture, if you will it, there are definitely resources available, as the theatre inside Keyano college has the budget to bring in the Moscow Ballet to perform in their deluxe auditorium theatre with some of the most advanced sound and lighting technology available. Invited up to view the premiere production of High School Musical, I too was wowed by the production values available. The material, which is basically an updated version of Grease, may not necessarily be up my alley, but I cannot deny that this production went above and beyond the genre of musical theatre and provided an evening of sensational entertainment. Theatre often fails for me in the clashing of egos outshining one another and actors simply going through the motions, but under the direction and choreography of Julie Funk, each and every single performer in the 20-plus ensemble moved, and I mean really moved together under a sweeping singular vision. And while the only theatre was full on its first night of a week-long run, the only art gallery sat empty below, shut down several years ago—but not due to the lack of activity. Roaming the halls of the college and glancing up at a series of posters lining both walls, there had been an active lecture/residency series between 1995 and 2005 featuring visual artists from Monica Tapp, Alex Janvier, Peter von Tiesenhausen and many U of A art professors. After asking around, the general consensus was that the program and gallery have been shut down partly due to the lack of personnel to administer the space (which translates to lack of interest in hiring for the position), and partly due to the lack of visible (i.e. quantifiable) value for the community. The gallery, which in and of itself was already a small space, now simply sits empty save for the odd occasion it is used as coat check. As an empty space in a town riddled with the lack of space, the value of having a visual art gallery is unfortunately undervalued, as the theatre, which is also able to generate revenue, remains heavily programmed with an artistic director. Spending a morning with Garry Berteig, who laid the foundation for most of Keyano’s visual art department some 20 years ago, I walked away with the sense of how isolation affects how we live, but also how we maintain inspiration. Having lived and traveled around the world from Toronto to Greenland, Berteig is somewhat of an anomaly, maintaining a friendship with Bill Viola and increasingly turning more inwards as he investigates the environment as an expression to our inner conditions. Having to give up his studio when the last boom forced rent to double, the Saskatchewan-born artist has had to return at least one major grant due to the lack of studio space to complete the project. Running the lecture series until it ended, Berteig is well aware of the potential for the visual arts department, but also after 20 years, I don’t get the sense that he believes things are going to change anytime soon. Click on the title to read Amy Fung's Akimblog review on the Art Gallery of Alberta along with snapshots of Peter Robertson Gallery, Front Gallery, and Bearclaw Gallery.